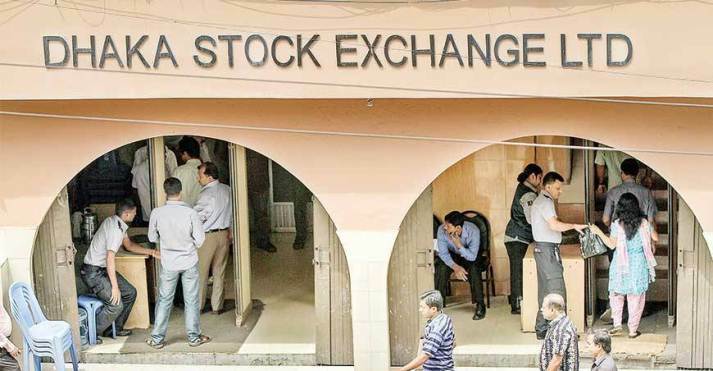 The Stock markets in both Dhaka and Chittagong are slightly up today with a trend of recovery as the major indices have been found finishing upwards with marginal rise of some large-cap securities. The broader DSEX index of Dhaka Stock Exchange (DSE) closed the day with 0.70 points up at 4569.13. On the other hand, the blue-chip DS30 and Shariah DSES fell by 3.63 points down at 1785.66 and 1.10 points down at 1121.12. The Chittagong Stock Exchange (CSE) closed the second day of the week with upward trend with its major CASPI 16.88 points up at 14,063.67. The daily turnover in volume was at DSE to 10.77 crore shares when the daily trade value was Taka 463.29 crore. At DSE, out of the day's 324 traded issues, prices of 142 securities closed higher against 118 losing issues. At CSE, issues traded 245 while 112 closed higher against 86 closed lower. The major gaining issues were BD Thai, Ambee Pharmaceuticals Limited, Desh Garments Limited, Apex Spinning and EASTRNLUB. The major losing companies were Fareast Life, Exim 1st Mutual Fund, Renwick Ja, HR Tex and Modern Dye. The BSRM Steel topped the turnover leaders followed by Titas Gas, CVOPRL, DBH and BSRM Limited.